The killing of Eric Garner, Mike Brown, John Crawford III, and Ezell Ford over just four weeks last summer, and the subsequent failure to hold any officers involved responsible, spurred a national conversation about police violence and systemic racism. The killing of Eric Garner, Mike Brown, John Crawford III, and Ezell Ford over just four weeks last summer, and the subsequent failure to hold any officers involved responsible, spurred a national conversation about police violence and systemic racism. Community members, often led by tenacious young leaders, planned direct actions, die-ins, walk-outs, and acts of civil disobedience to demand accountability and recognition that black lives matter. From New York to Seattle, outraged elected officials walked out of city council meetings and state buildings with their hands up to express solidarity with, and commitment to, the movement for police and criminal justice reform. Communities across the country that have lived for too long under the weight of discriminatory policing and mass incarceration are calling for a transformation of our policing and criminal justice systems. They are making it clear that it is time for policies to first and foremost reflect the concerns and solutions of communities most affected by flawed policing practices. Communities are demanding meaningful oversight of law enforcement, accountability, an end to the criminalization of communities of color, and an investments well beyond federally-sponsored tanks and additional police. 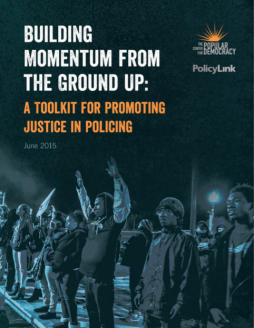 To support the efforts of community organizations and elected officials, the Center for Popular Democracy (CPD) and PolicyLink have created Building Momentum from the Ground Up: A Toolkit for Promoting Justice in Policing. The Toolkit is a direct response to organizers, elected officials, and community members from across the country seeking support and resources for campaigns aimed at transforming the policies and practices of local law enforcement.